Murielle became a member of St. Peters Parish in 2000 after she moved to Calgary from British Columbia. She retired from her career as an elementary school teacher in 2009. Since then she has been looking for ways to serve St Peters. Murielle is a member of the Catholic Woman’s League, a Sacristan, an Altar Server, and is one of the Catechists for the sacraments at the parish. Murielle currently help with funeral masses, the training of Altar Servers and she schedules and facilitates meetings for the weekday Sacristans. By getting involved, she has made many wonderful friends. Murielle and her husband Paul have two adult daughters and four wonderful grandchildren. . In addition to her involvement at St. Peters Parish, Murielle is a Patient Assist Volunteer at the Alberta Children’s Hospital. 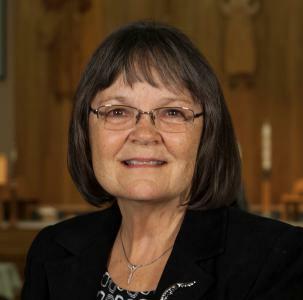 As a member of the Parish Council, she wants to continue to support the work of the existing ministries at the church and to nurture new ideas that allow continued growth in the Catholic Community. Murielle welcomes the upcoming church expansion and looks forward to using her skills sets to support this endeavor.